We have a good-sized stash of unique painting tools, but my girls love the novelty of painting with various gadgets and objects from around the house. Whether we’re raiding the office supplies or the kitchen drawers, there are always interesting items that can be turned into painting tools. It’s always fun to think outside the box when you’re creating art! Here are 7 of our favorite unusual and simple painting tools. Many of these painting tools inspire big movement, from bouncing balloons to wiggly rubber bands. Covering your whole table with paper allows for even bigger exploration and fun! To make a simple rubber band brush, use a rubber band to secure 5-6 rubber bands to an unsharpened pencil or handle-end of a paintbrush. 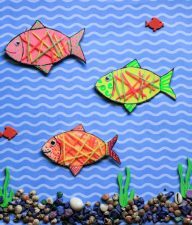 You can cut the rubber bands to make long pieces, or leave them as-is to create interesting designs! Whether you wrap it around a block, or cut it into fun shapes, bubble wrap makes an irresistibly fun painting and printing tool. When you’re done, you can pop the paint covered bubble wrap for even more fun! I always seem to have a few random balloons around my house. 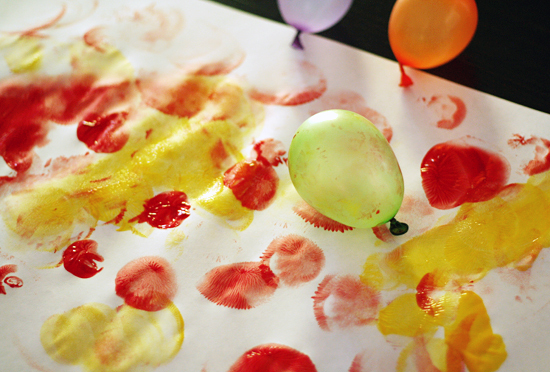 Put those balloons to work during your next painting session. Try dipping them in paint and bouncing on your paper, or bounce them on a full page of wet paint to lift and move the paint around. 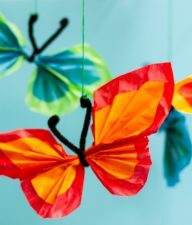 You might want to take this fun project outside! A small kiddie pool is great for mess containment! 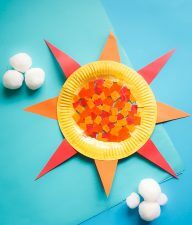 A thin layer of paint on a paper plate is the perfect partner for a pile of cookie cutters. Dip, print, repeat! The more cookie cutter designs, the better! Experiment with different types of fabric, such as lace, corduroy, tulle, flannel, and fleece. Scrunch the fabric and dip it in paint, or paint flat pieces of fabric and print them on your paper. 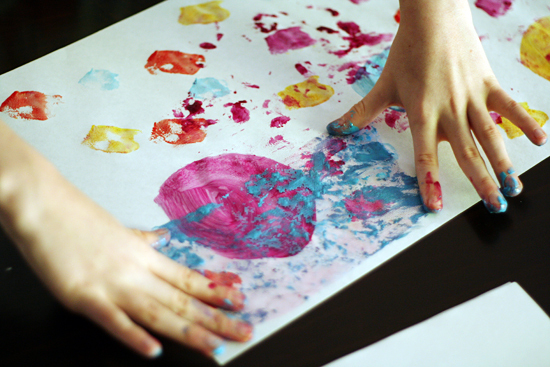 Move beyond finger painting and try elbow painting or toe painting! If you’re feeling real adventurous, nose painting is great fun, too! Just make sure you’ve got a hose or shower ready when you’re done painting! Smearing, scraping, and scratching paint with plastic cards creates unique textures, and it’s just plain fun! You might save some money, too! 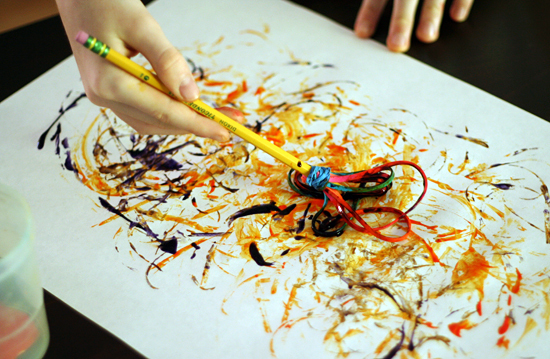 What kinds of unusual tools or household items do your kids like to paint with? That rubber band idea looks super fun! I can’t wait to try it with the kids! ??????? ?? ???? ????.? ????????? ????? ???? ??????????,?? ??????? ??? ??????????,???????.?????????? ??? ???????? I’m such a huge fan of painting experiments. This is a great list, Amy! Some great ideas! My kids love the bubble wrap, but I’m totally trying the rubber band technique! 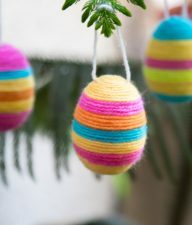 Love that rubber band idea! Clever ideas! We just learned how great it is to use various paint brushes and water (yep, plain old water!) to “paint” on our driveway. Serious fun! Love your ideas-what a nice way to encourage creativity. We like painting with our toys-blocks, cars, etc. Also with natural items-branches, flowers, etc.